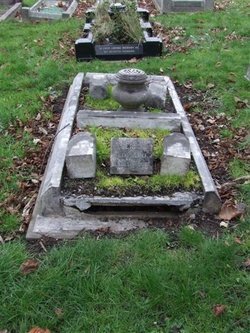 Eric was the only son of Edward Cheesman and Elizabeth Florence Jackson. Their only other child, six year old Molly, was in the park the night of the fire along with her mother. 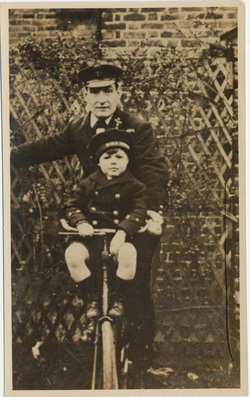 Eric's father Edward was a chief stoker with the Royal Navy. He had been discharged with a disability pension after twenty two years service. Edward had first arrived in Gillingham in 1901, he was serving aboard the HMS Dasher. He had been orphaned in 1891 after suffering the deaths of both his parents with in a short period of time. Following their deaths he lived in the St. Mary's orphanage in London. Edward had four other siblings, Willam (the creater of this web site's grandfather), Matilda, Rose and Mary. Their parents death tore this family apart. Tragically these siblings would never see each other again, a tremendous loss for not only Edward but his brothers and sisters as well. 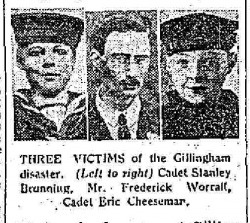 In 1911 Edward was still living in Gillingham working as a leading stoker with the Royal Navy. In September of 1913 Edward married Elizabeth Jackson. Eric was born in 1916 and Molly in 1923. The family would eventually move to 31 Watling Avenue, Chatham. Eric had been a member of the Royal Navy Cadets for 18 months prior to his death. He won a scholarship to the County School and was eagerly looking forward to the school sports which were to have been held on the Saturday following the fete. He had hoped to win a prize in the high jump competition. He was not chosen to be one of the party guests awaiting rescue at the fete. Very disappointed he begged his mother to ask for permission for him to join the other boys. Sadly it was Molly's screams of "Eric's burning, Eric's burning" that first alerted many to the tragedy unfolding before their eyes. Eric's father Edward was not present at the fete. He would later identified the body of his son. The family, unable to tell Molly the truth, at first told her that Eric was in hospital with his hands burnt. Sadly this was not the case. Eric perished in this fire and his heart broken family would never recover from this incident. Eric's body was carried on a gun carriage to his grave. Sadly Eric's father Edward became very ill and died four years after his son. 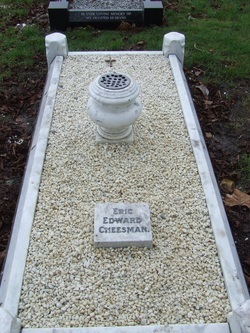 Edward was buried along side of Eric on January 14th 1933. Elizabeth (called Aunt Floss by her family), Eric's mother, would never recover from deaths of her son Eric and her husband Edward, she needed constant help and care to cope. A life long friend who was possibly a cousin, Cicely Jordan (nee Smith) was constantly there to help Elizabeth cope. People from around the county had sent so many lily's after Eric's death that they soon overflowed their home and some had to be distributed to other family members. Molly and her mother continued to live in the house on Watling Avenue for a few years following the deaths of Eric and Edward. Their neighbour just a few houses down was Dorothy Phillips (nee De'Ath). She would chum with Molly until Molly married in 1946. She remembers Cicely being in the home helping and also remembers being told once about the family member that died in a fire in the park. She has said that comment stayed with her all her life because as a child she couldn't really understand how somebody could die in a fire in a park. The details of this even were never explained fully. Dorothy would have another interesting connection to the Cheesman family. In 1984 she purchased Brook Cottage in Lingen Herefordshire England where the family of Edward's brother William would be living from 1921-1922. The brothers would have been totally unaware they were living so close to each other. The creator of this web site, Lori Oschefski's mother Muriel was born in this cottage in 1922. After her birth William and his wife Annie separated. 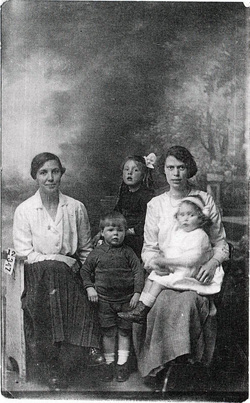 Annie unable to care for her children admitted them to the Kington Union Workhouse in Herefordshire where they lived until they were sent back to Canada in 1924. Most of the children were adopted out in Canada, including Muriel. It is a terrible shame that neither family was allowed to know each other and to help each other out in tragic times. 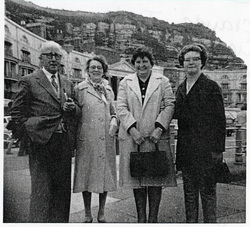 Following Molly's marriage in 1946 the family left the area for good. 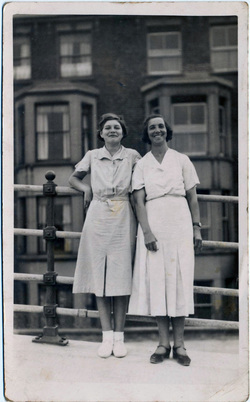 Elizabeth remained close to Molly until her death in 1968. Molly and her husband Leslie Gordon Blomfield had only one child, a daughter Hilary. Hilary was born with Cerebral Pasly and in spite of her challenges would become a school teacher in Kings Lynn, Norfolk where the family had relocated to. In spite of their sorrows Molly and Leslie were known to be the life and soul of family gatherings. They had spent many joyful Christmas days with the family of Phylis Jordan, daughter of Cicely. Phylis, at the age of five, was also in the Gillingham Park the night of the fire and she never forgot the terrible sight of those young boys dying in the fire. She only told her family once what it was like for her and what she saw, they can only describe it as "dreadful". One can only imagine the horrors little six year old Molly carried all her life in her heart and soul after she witnessed her brother Eric perish. In 1982 Molly's husband Leslie passed away. In 1985 Hilary suddenly fell ill one day at school and sadly died the following day. She had never married and did not have any children. Molly passed away shortly after her death. Molly never forgot what she saw in the park the night her brother died. She had shown signs of the strain and heartbreak of this her entire life. There is no one left now in this family. Edward's brother William was picked up by the Dr. Barnardo homes following their parents death and was sent to Canada in 1894. He would marry Annie Rita Marion Prince, together they five children in Canada before returning to England. Their sixth child would be born in England. Some of these children were given the names of William's siblings, including a son named for Edward. Their sister Matilda would marry Frederick Robert Jefferies and they had two daughters Emily and Annie . Emily married William Orvesto Wilkins. Their children included William, Mary, Charlotte and Percival. It is unknown what happened to the other Cheesman siblings - Rose and Mary. Garden Party photo provided by Dorothy Phillips.